My third great grandmother Elizabeth (Buchanan) Baker died 158 years ago today. There’s some debate as to exactly where she died. One family story says she died in Arkansas while the family was en route to Texas from Iowa. Before she died, the story goes, she made the family promise that if they buried her there, then once they got settled in Texas, they’d come back for her and bury her on their land near their new home.1 Others say she died after reaching Texas. When I was researching Iowa history for this week’s post on Iowa’s Constitutions, I couldn’t help but think about Elizabeth and the amazing raw courage she showed as she uprooted and followed Martin and uprooted and followed him and uprooted and followed him time and time again. But much had been lost in the move from Cherokee County. 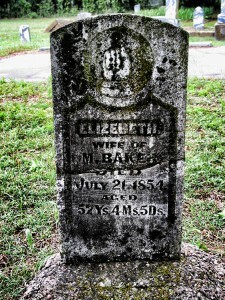 I can just picture Elizabeth as she looked back, over her shoulder, once again leaving behind everything she knew — including, we believe, a daughter, whose existence was reflected in the censuses,16 whose name was recorded in family histories as Susan,17 and who was never seen again in family or public records after the Bakers left Cherokee County. It isn’t clear to me that Elizabeth even had a chance to get comfortable in Pulaski County before it was time to leave again. Although Martin and sons Josiah and William were taxed in Pulaski County, Kentucky, in 1851, oldest son David D. Baker was not.18 He had gone ahead to Louisa County, Iowa, and, by 1852, Martin and William would follow him west. So once again Elizabeth had had to pack everything she owned, say goodbye to everyone she knew, and look over her shoulder as, once again, she followed her husband into the unknown. And how painful this departure must have been! This time, two sons — Josiah and Charles — didn’t travel to Iowa with the family. Both stayed behind and were recorded in the tax rolls of Pulaski County in 1852.19 We know, now, that both of those sons did make the trip west a year later — but could Elizabeth have known that as she looked back, watching Pulaski County fade in the distance? Did she truly believe, as the wagons rolled west, that she would ever see those children and grandchildren again? We’ll never know for sure if Elizabeth lived to see the family’s new home in Parker County, Texas. The story, remember, is that she died in Arkansas. But I’d like to believe that she got there and approved of Martin’s choice of land. I’d like to believe that she met and perhaps even approved of her soon-to-be son-in-law George Washington Cottrell. I’d like to believe that she was surrounded by as much comfort as the frontier could offer when she breathed her last 158 years ago today. Judy, I have a story of courage for you. It involves the brother and wife (Edward & Elizabeth) of the deceased relative, Frank McCormack. Back in the mid 1880s, Edward and his father, Michael McCormack, bought a total of 160 acres in northern Michigan near Alpena. Michael didn’t stay long so Edward took over the entire 160 acres. By the summer of 1897, Edward and Elizabeth had 4 children, two boys and two girls. The winters of northern Michigan can be brutal. Sometime in early Feb 1898, Edward died. Here was a new widow with four children all under the age of 10 with the youngest being under a year old alone in northern Michigan. There is one thing that I “forgot” to mention. Elizabeth was four month pregnant with child #5 who would be born in July 1898. Elizabeth never remarried. When Edward died, Elizabeth was only 30 years old. She became a general store owner. When she was almost 69, one of her daughters died in 1936. It was decided that Elizabeth would raise the two granddaughters. Telling Elizabeth’s story is one of the great stories that I have learned in researching my family’s history. Her story is also one of my favorite stories to tell. Wonderful story, Jeff! What a tough lady she was. I can understand why that’s a tale you love to tell. Judy, this story about your third great grandmother is beautifully written. I’d like to share it with my genealogy society writing group at our meeting this Friday. Ah, Ginger, you’re too kind. Of course, you can share it with your writing group! Thanks for asking.